Timeless ends its season with a finale so good, it can't be cancelled… right? This review contains information about “The General” and “Chinatown,” the final two episodes of Timeless’s second season. They are very good and end with a terrific cliffhanger, so please don’t read this until you’ve watched. Cool? In the closing hours of the terrific second season of Timeless, Shawn Ryan and Eric Kripke’s time-travel series achieves a balance for which its been striving throughout its two seasons. It’s gotten there before, sometimes for a scene, sometimes for a moment, even occasionally for a full hour. But with “The General” and “Chinatown,” the show hits that balance all the way through. It’s part time-travel adventure, part intrigue-filled spy show, part educational romp (Wishbone, but for history), with a dash of romance and a healthy smattering of dark, irreverent comedy. There’s not one episode of this season I thought was anything close to bad, but it’s delightful to see it wrap up the season firing on all cylinders, doing all the things it does as well as it has ever done them. In short, these episodes are great, and if they’re the last we ever see of Timeless, I’m going to lose my damn mind. The list of reasons these two episodes, which make up a gripping two-hour finale, are great isn’t a short one, but near the top of any such list would have to be this: The Timeless writers have used the previous eight episodes extremely well, ensuring the audience would understand, and often care about, the characters that populate the show. We got an hour in which we could learn about, and begin to care about, Connor. We got an hour in which Agent Christopher sat at the center. We learned more about Jiya and Flynn, and about their relationships (one straightforward, the other anything but). We learned about Carol, and about Jessica, and hell, we even got an hour in which we got to understand Emma a bit. Every one of those stories was interesting on its own, but they’re even more interesting in hindsight, because remove even one of them and these hours don’t work nearly as well. It’s not just the efficient, thoughtful character development, either. There are moments in both these episodes, and in “Chinatown” in particular, that work because Timeless has demonstrated that it’s capable of subtle, layered stuff. That means Carol’s death can break Lucy’s heart in more ways than one, that Lucy’s speech before they leave the Boar’s Head can be both inspirational and real damn irritated, and that Wyatt hitting Lucy in the face can be both an honest mistake and a sign of how grievously he’s erred. 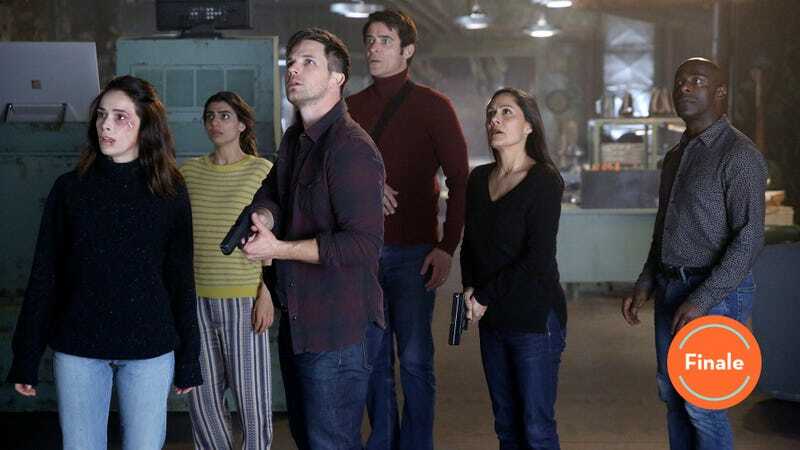 Timeless trusts that we can embrace those complexities even as the romp continues, because it’s demonstrated again and again that, as they say on another great show, the situation’s a lot more nuanced than that. But come on, you’re just here to talk about that ending, so let’s talk about that ending. The conversations about how much time can change started early. Sometimes it worked—yay, Hedy Lamarr!—and sometimes it didn’t, but there was never any evidence that Jiya’s visions could be avoided, only altered. The theme of dreading the inevitable started early, too. Last week, Flynn reminded Lucy (and us) about the diary, and mentioned that Lucy herself gave it to him in a trip that would have required her to enter her own timeline directly, mentioning his theory that perhaps the Lifeboat is upgraded in the future to make such a trip possible. Hell, the very first episode in this season introduces the idea of sleeper agents who embed themselves in the societies and events they’re directed to change (what’s up, Jessica?). Most importantly, since early in the season, the show has demonstrated Wyatt, Rufus, and Lucy’s willingness to say “screw it” and break the rules in order to do what feels right. That ending is a shocker, to say the least—and, it’s worth noting, the effect that makes it possible is top-notch, right down to the first Lifeboat getting bumped by the second—but it’s not jarring. The second you see Wyatt (Matt Lanter) and Lucy (Abigail Spencer) emerge from that ship, everything makes perfect sense. We don’t know at what point the Time Team starts working to upgrade the Lifeboat to make this trip possible, or how they intend to save Rufus, but of course they do and of course they’ve got an idea. Timeless has been telling us over and over again, all season, that these people are done keeping their hands clean. They’ve got a time machine, and they know how to use it. The show has also spent a whole season, and these last two hours in particular, reinforcing the fact that the members of the Time Team have grown to love each other like family. Eight episodes ago, a scene between Connor and Jiya wouldn’t be likely to break your heart. Now, just try to make it through that one without hurting a little. Because so much of the focus in these hours is on the emotional connections—and not just the romantic ones—between these people, that last reveal isn’t just thrilling. It tells us, instantly, so much about what happens in the years (let’s assume five, since that was Flynn’s guess) after Rufus’s death—namely, that the team refuses to accept it as a part of their reality. Rufus cannot be dead, so let’s upgrade our time machine and get to work. It also tells us that Lucy doesn’t take her battering at Emma’s hands lightly. The Lucy that emerges from the Lifeboat doesn’t just look different. She moves differently. She’s a soldier, not a historian, and she sure as hell doesn’t seem to be coming from a comfortable existence. Abigail Spencer is unsurprisingly terrific in these two hours, but it’s in that frightening fight with Annie Wersching’s Emma that she really soars. They both do. It’s complicated, layered stuff, laced with grief and hatred and jealousy and fear. That it’s also a really good fight scene is quite a bonus. Still, as good as Spencer is—as good as Lanter, and Wersching, and Claudia Doumit, and Goran Visnjic, and Sakina Jaffrey, and Paterson Joseph all are—it’s hard to imagine anyone picking an MVP of this finale, or of this season, that isn’t Malcolm Barrett. That tone mentioned above, the careful blend of history, romance, adventure, dark humor, and wibbly-wobbly, timey-wimey stuff, wouldn’t be possible without Barrett’s performance as Rufus. Barrett has the gift of making sure all his one-liners come from somewhere other than the desire to be funny; nearly all of Rufus’s best jokes are tied in some way to fear, anxiety, or anger. Barrett’s Rufus is a person of immense empathy, who just a few weeks ago was reminding everyone that Flynn is a murderer, but who in this hour strolls along with him comfortably. He’s kind and funny and brilliant and generous, and Barrett’s performance underlines all those things without ever making Rufus seem like some unrealistic paragon of virtue. He’s a great character, played by a great actor, and that makes his death one that neither the characters, nor the audience, will find easy to accept. 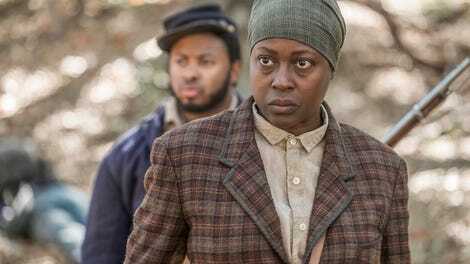 This review could continue for another 1200 words and still overlook things one could praise: the careful handling of Harriet Tubman’s story and the importance of the show’s continued commitment to making sure the historical figures they encounter are more than shallow paragons of virtue; the terrific, understated performance from Christine Horn as Tubman and her graceful, thoughtful conversations with Barrett’s Rufus; the evocative staging, excellent costuming, and lush cinematography; Annie Wersching’s pitch-perfect delivery in the scene in which she dispatches her superiors in Rittenhouse; the effervescent dialogue and the terrific structure; the list goes on. But the one thing we absolutely can’t bypass was how nimbly, how easily, Timeless accomplishes the one thing every finale dreams of, but which so few truly accomplish: It made me want to find out what happens next so damn badly. “The General” and “Chinatown” together make for a useful two-hour demonstration of why this show deserves a third season, and hints at how engrossing and thrilling that third season could be. NBC, if you’re there, please give this one another go-round. It deserves it, and so do we. “You never wondered why there were so many ugly scarves tucked away around here?” Timeless might be better than any other show on network television at writing lines of dialogue that make you chuckle as your heart breaks, just a little. If you want this show to come back, I’d get loud about it. Odds are its fate will be decided this week.